Kick back, relax, and enjoy some sports on TV with the Cannelton Power Reclining Loveseat with Adjustable Headrest by Ashley Furniture. Your company will love its double stuffed pillow top arms and soft-as-suede upholstery while they enjoy the infinite comfort positions of the power reclining mechanism and the Easy View™ power adjustable headrests. A USB charging station lets you charge your devices while chilling. The family-friendly dark gray color and creative stitching add panache, ensuring that this bustle back loveseat will always be a win. Kick back, relax, and enjoy some sports on TV with the Cannelton Power Reclining Loveseat with Adjustable Headrest by Ashley Furniture. 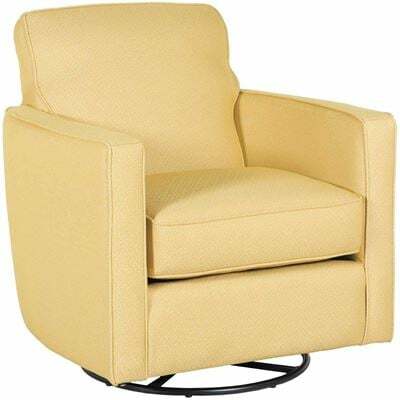 Cannelton Power Reclining Loveseat With Adjustable Headrest from Ashley Furniture. Loveseat is covered in a tri-colored gray polyester fabric.